Marko Rodriguez gives us a step by step guide to building a graph-based movie recommender engine using the publicly available MovieLens dataset, the graph database Neo4j, and the graph traversal language Gremlin. Which users gave Toy Story more than 3 stars? Which users gave Toy Story more than 3 stars and what other movies did they give more than 3 stars to? How many of Toy Story’s highly co-rated movies are unique? Which movies are most highly co-rated with Toy Story? 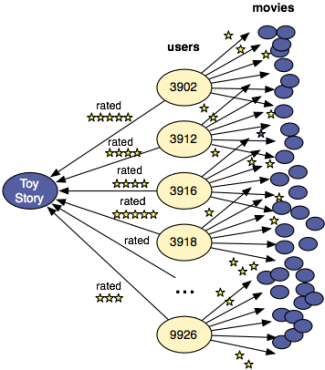 Which movies are most highly co-rated with Toy Story that share a genera with Toy Story? Which movies are most highly co-rated with Toy Story that share all genres with Toy Story? Check out his blog post here, keep it up Marko!